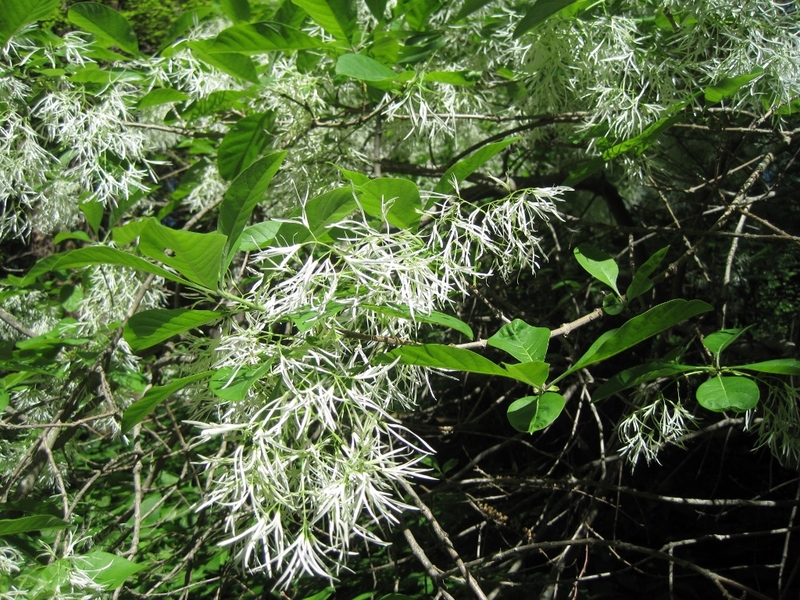 or Fringe Tree. Right on schedule, as always, it looks like the removal of that big old limb has not bothered it in the slightest. A completely underused shrub, incredibly fragrant, disease resistant, native, reliable bloomer, long lived, good form. And so on! The only thing I can figure is that it must be a nightmare to propagate. Indeed, I believe you do need male and female plants, which doesn’t help, and fruit set is erratic. Still! 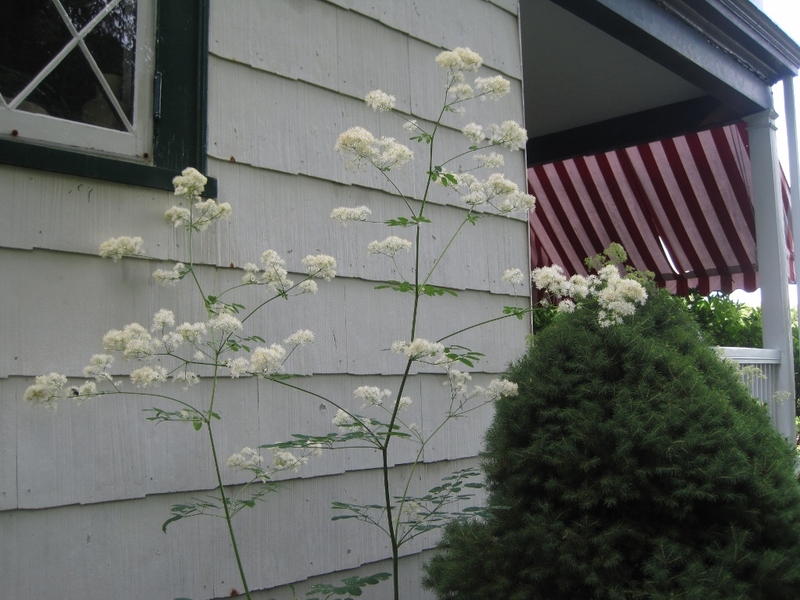 Also known as Meadow-Rue. Now, which Thalictrum it is I don’t know. (It is ‘a difficult genus with poorly understood species boundaries’ according to Wikipedia, Oy!) Our common roadside one though, doing admirably as a garden plant under the library windows. Very consistent structure to its blossom spikes and quite capable of getting six feet tall. When given more space, as is the case with the end one, you can see it can be fairly substantial. The others are kept lankier because of the hostas they are competing. It will self seed, which isn’t a problem with this plant since the seedlings are very puny for the first few years. A new view! 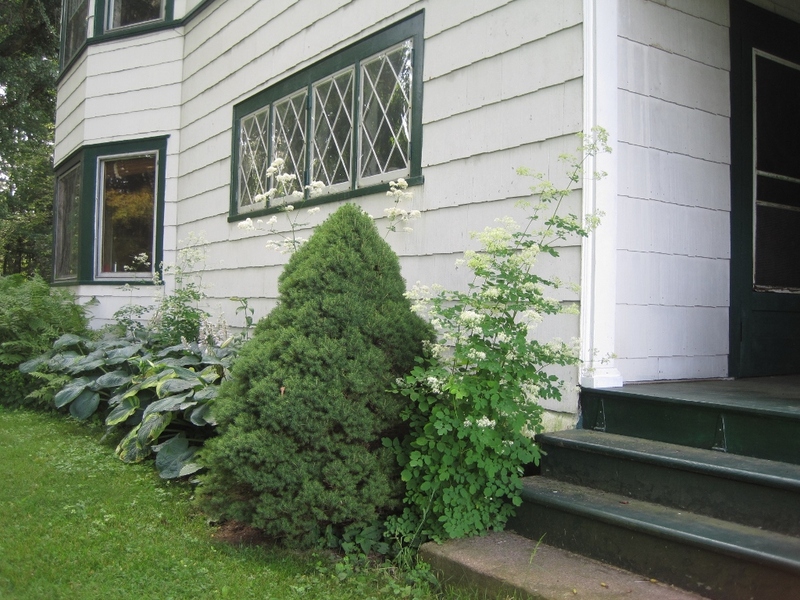 From left to right: inkberry, ninebark, russian cyprus, witch-hazel, itea (hiding), enkianthus. 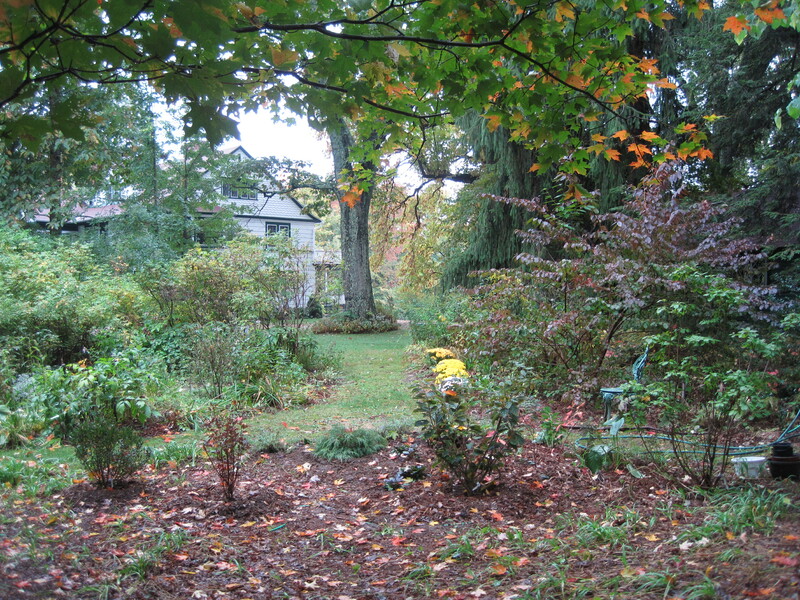 The bright yellow in the mid ground are some chrysanthemums, to the right of them are the azaleas and double-file viburnums; the rose garden (which will be quite happy to have more sun) is mid-ground left. Well not really, actually. 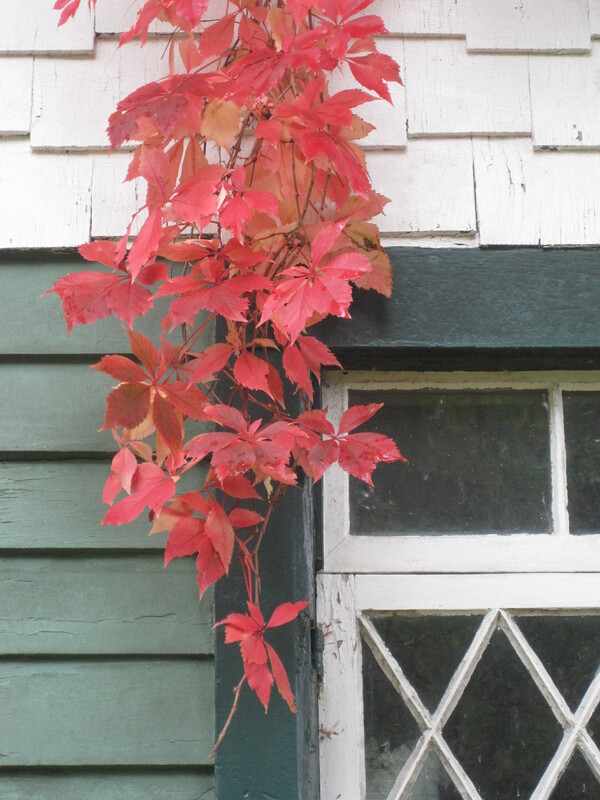 The woodbine (virginia creeper) is particularly happy this year. 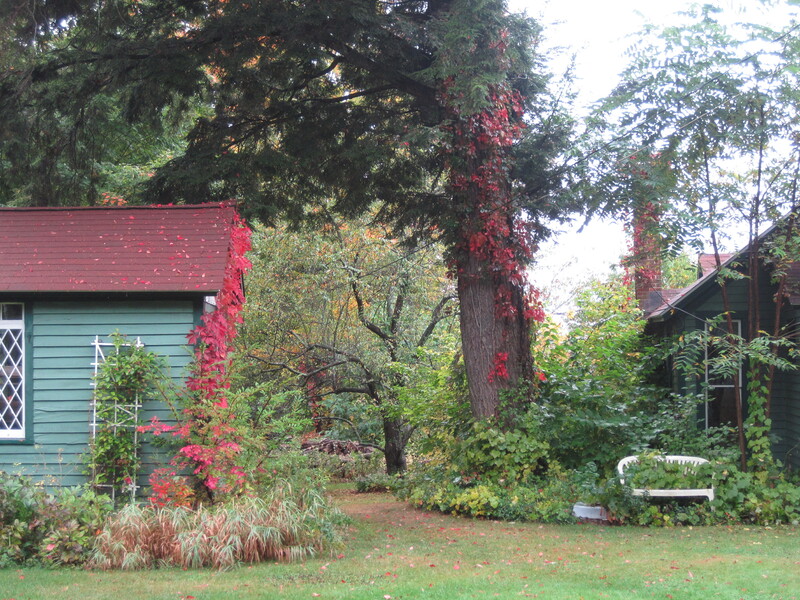 These pictures don’t do justice to the one growing in the hemlock at all, nor to festooned chimney on the little house (not visible in the first picture). But take note of the gingko tree in the background, the woodbine has quite quietly established itself in it. Comments Off on Bleeding trees! Still, there is some learning going on. Flat-topped goldenrod for example, has leaves that look more like a slightly overgrown tarragon than a goldenrod. The beautiful wild blue relative of our fall garden asters has smooth leaves that feel like kid leather; it looks very weedy indeed…until now, when its color has the cultivated varieties well and truly beat. Blue wood aster has slightly paler, yellow leaves than the more common white wood aster, and a more pronounced notch at the base. Grey goldenrod has leaves that look almost like a sage leaf, but without the pebbly texture. The calico asters, with their thousands of little flowers, are very stiff, with lots of little branches and leaves. One of the goldenrods that bloom all along the stems has a beautiful purple stem, the other doesn’t. The purple one has better form (and naturally is not growing in an area that is likely for long term survival: south of the barn where I must, must, do some weed whacking). And so forth. The goal, of course, is to be able to edit the meadow lawn areas correctly in the spring. For example, now that I know the difference between the flat-topped goldenrod and the regular goldenrod, I can remove the latter and keep the former in one area where the flat-topped type gives the right look. (besides being rarer) Thankfully, because I didn’t know what the weird tarragon like thing was this spring (though clearly Not tarragon) and did remember that it was where the flat-topped goldenrod had been I didn’t pull all of it…quite! 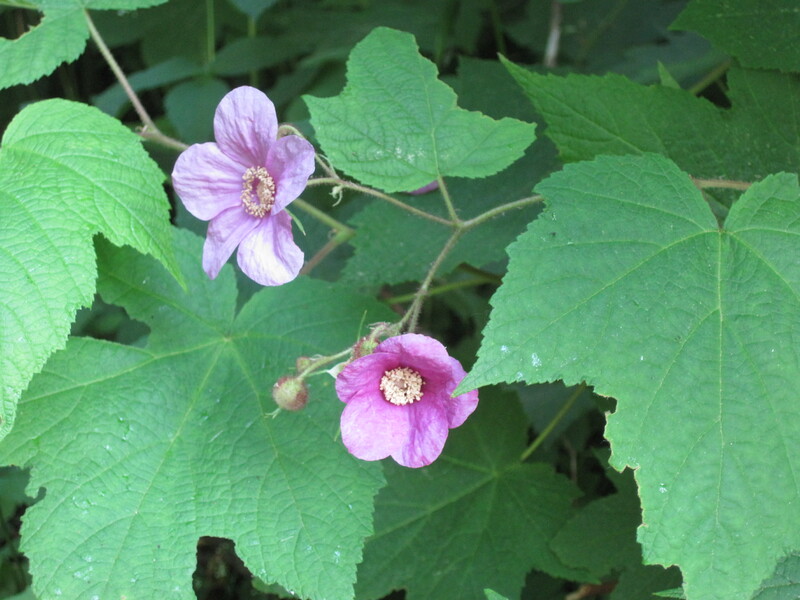 Also known as (purple) flowering raspberry has got to be one of the most under-utilized native plants out there. 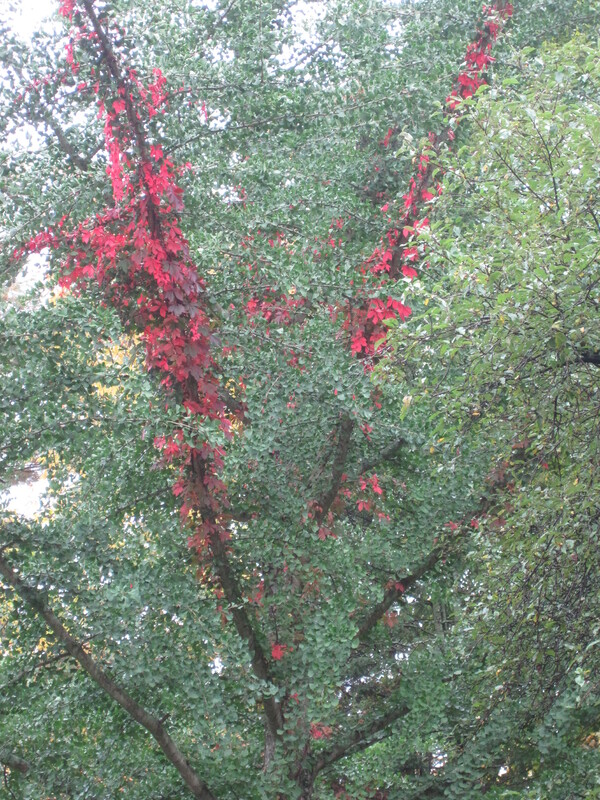 I was first introduced to it growing as an under-story plant on Mont-Royal in Montreal. 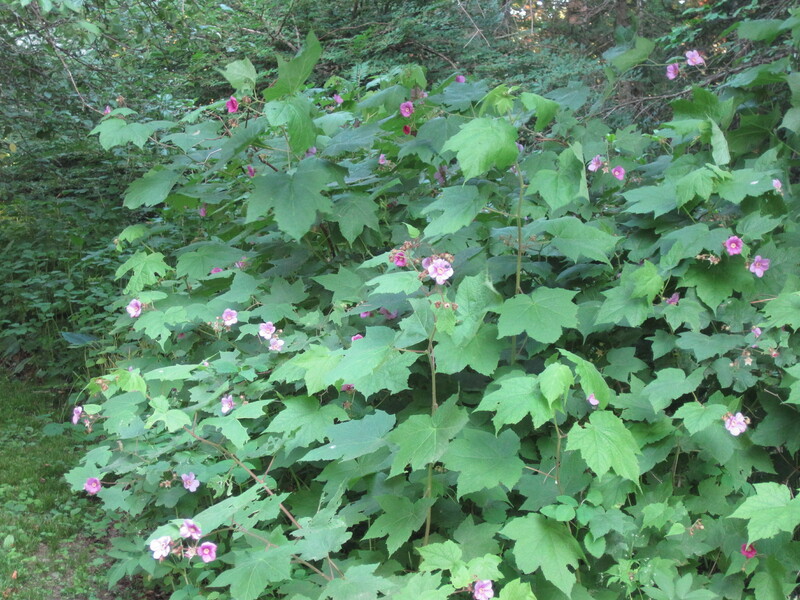 It likes well-drained edge/woodland openings and grows throughout the Appalachian mountain chain. A member of the raspberry family, but pretty far out there. 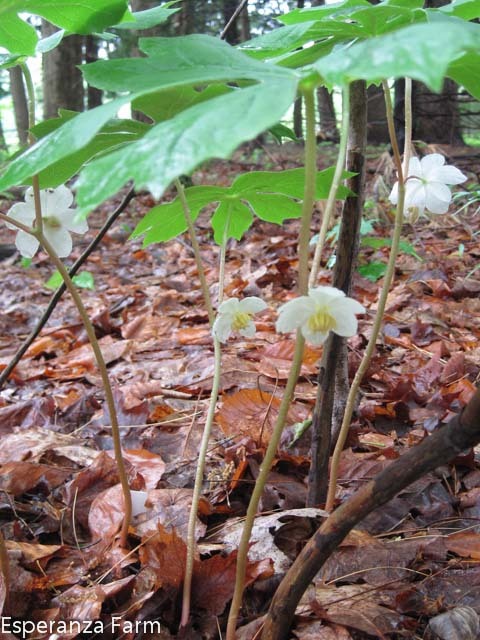 It is thornless, grows to about six feet, spreading by runners, with large maple-like leaves, the bark on old canes (at least three years old) is tan, exfoliating, with darker cinnamon colored bark beneath. 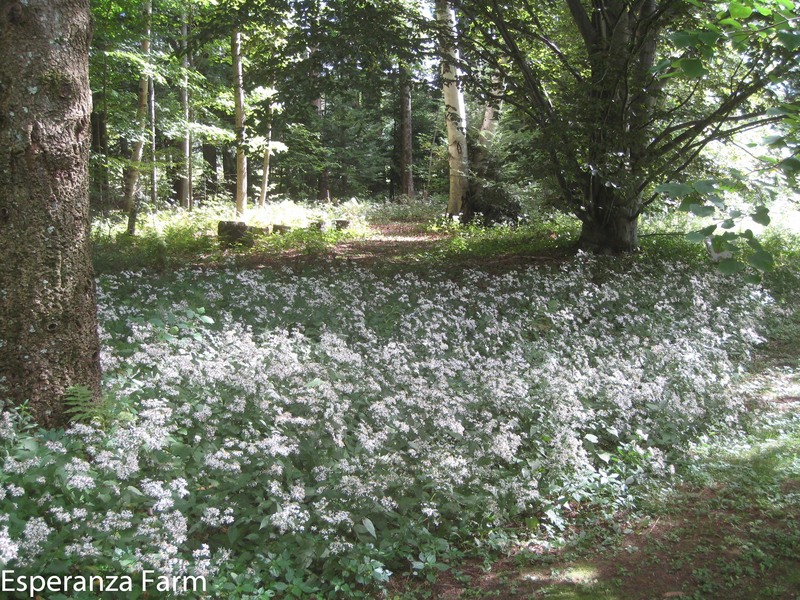 The flowers begin to appear in June and run well into July or later. They are about an inch and a half across, light purple with gold centers. The fruit is relatively dry, some people like the taste but it is not the selling point; the flowers are. I got some a few years ago from a friend. It has happily spread where-ever there is sufficient soil moisture. It appears to be largely pest free. 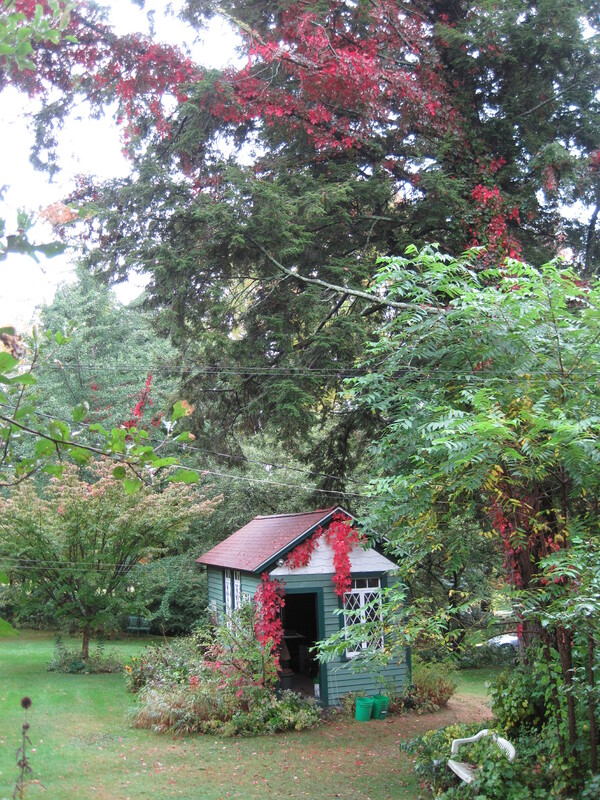 Here a stand has happily taken over an otherwise difficult area on a slope under an apple tree and blue spruce, at the edge of a parking lot. 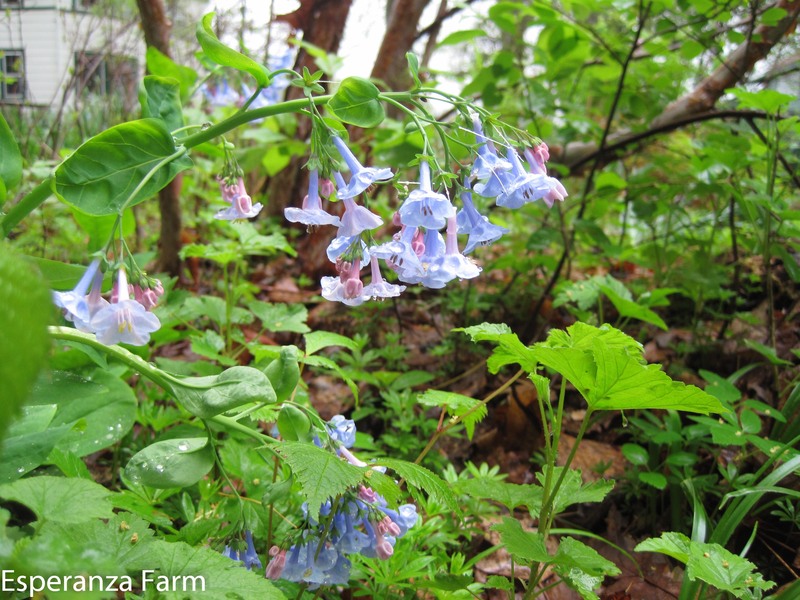 A wildly underused native flower, mertensia virginica, otherwise known as Virginia Bluebells. This plant likes shady, moist woodlands. It flowers in the early spring and goes dormant in the summer. Its big green leaves look a bit like fuzzy lettuce (though when they come up the buds are almost purple/black). Its flowers…well you can see. They start as pink buds, but when fully open are a lovely blue. They are similar in this sense to some of the pulmonarias or lungworts, but without the purple tones to the colors. It is about 12-18 inches tall with an arching, soft habit. We have one plant, hopefully we can get it to spread and/or divide it. Highly recommended…if you can find it. Cercis canadensis (Eastern Redbud) branches seen from above. It blooms in May and the flower buds occur all along branches, and sometimes even on very old trunks. 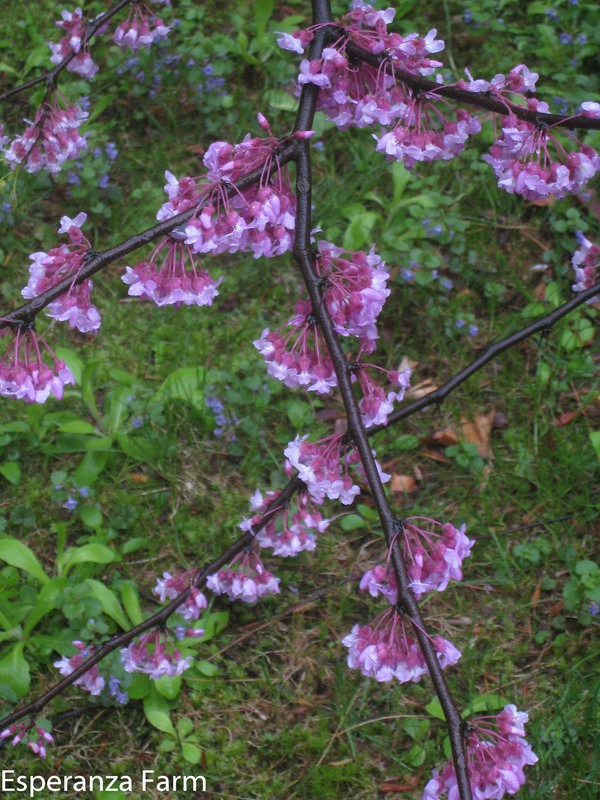 An extremely tough tree, native to eastern North America (there are related species elsewhere in both North and Central America, Asia, and Europe). The seed pods, which look like snow peas, are a winter food for chickadees, woodpeckers, and other tough little over-wintering birds. The wood and bark is very fibrous and it is relatively resistant to rot, allowing it survive breaks/tears caused by storm damage, which is good because it tears easily. The little blue flower in the lawn below is gill-over-the-ground, also known as ground ivy, it accounts for most of the east lawn. Seeing as I natter on about it so…. Here is one patch of it: this is the most recently created one, we simply stopped mowing the stretch between the Douglas Spruce and the Copper Beech because it was all moss. One year later, this is the result. * Wood aster is a takeover specialist. *For scale, it is an easy 15 meters between the two trees. This native, which I once saw blanketing acres of wooded bluffs above the Missouri River, is reputed to be a sturdy ground-cover. It certainly looks like it will like it here. Last year I planted a miserable pot (of three stems, one was broken, one was Ok, and one was dead). This year the clump had five stems and all bloomed, and four have set fruit. It would certainly be nice of it to spread. The flowers don’t last long, but it is the most unusual looking plant as it comes up in the spring. Quite fun.